Welcome to L&K Partners Inc.
L&K Partners, Inc. believes that construction management can be flexible, responsive and transparent. We believe that our clients’ objectives and project challenges can be accomplished through establishing and nurturing relationships based on trust and consistent reliability. We carry this belief into everything we do, on every project, every day. Since 1997 we have specialized in building fundamental relationships that allow us to do what we love most. We are a construction management firm building New York’s commercial interiors, hospitality, retail spaces and mission critical facilities. "CONSTRUCTION MANAGEMENT CAN BE CLIENT CENTRIC"
L&K Partners collaborated with a private foundation focused on advancing the frontiers of research in mathematics and the basic sciences. For this project, the client wanted to create a warm environment for their employees and visitors. We partnered with the client and design team to procure and install locally sourced materials. Through extensive research and collaboration with the team, the final project was delivered on time and within budget. One of the world’s premier jewelers and designers of timeless luxury goods engaged L&K Partners to build out its New York City headquarters. Bringing together various departments under one roof involved careful planning and execution. L&K and the design team worked together to bring the old and new traditions of the firm together. Constrained by an aggressive schedule, meticulous planning in the pre-construction phase was required to ensure that all the materials and equipment were in place for the construction phase. The successful collaboration resulted in a workspace that reflected the client's culture and brand image. Apple is one of the worlds best-known designer and manufacturer of consumer electronics and personal computers. 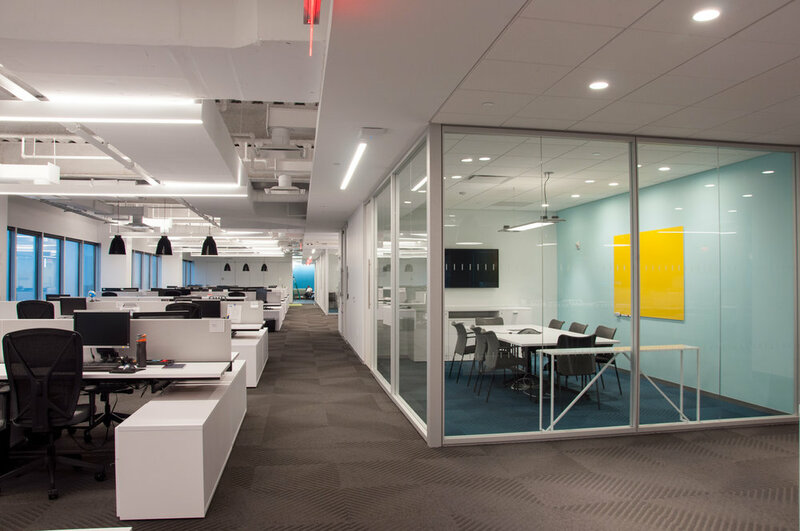 L&K Partners was hired to complete the build-out of their executive briefing center in NYC. The project involved the planning and implementation of a very sophisticated AV and presentation package. L&K coordinated the project details with the west coasted based project team to implement the design. 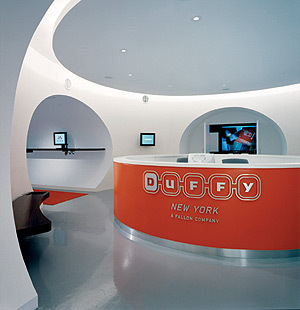 The final result was a space that reflected the iconic brand image of Apple and was completed within budget and schedule. L&K Partners was hired by Blue Ribbon Sushi to fit-out their new sushi restaurant in the iconic 30 Rockefeller building. The notable features include stenciled graphics with paint layering done by hand, and a massive custom-built grease trap. Project challenges included coordination with The Rainbow Room’s prep area. Complex duct work also provided challenges with lighting positioning. Regardless of the challenges, L&K Partners managed to deliver a great space to the client ahead of schedule. 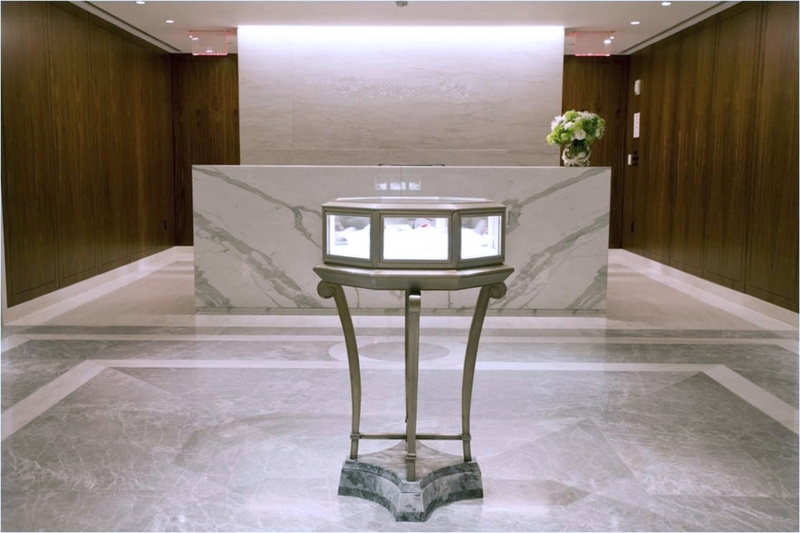 Cadar, a fine jewelry retail company, hired L&K Partners to build out their new showroom located in Midtown Manhattan. Their new showroom was built to specifications such that the space reflects their themes of subtle Art Deco, Art Nouveau, and Japanese artistic motifs and spiritual geometry. Features include custom millwork, bronze-stained mirrors, and gold-leaf ceiling in the vestibule. 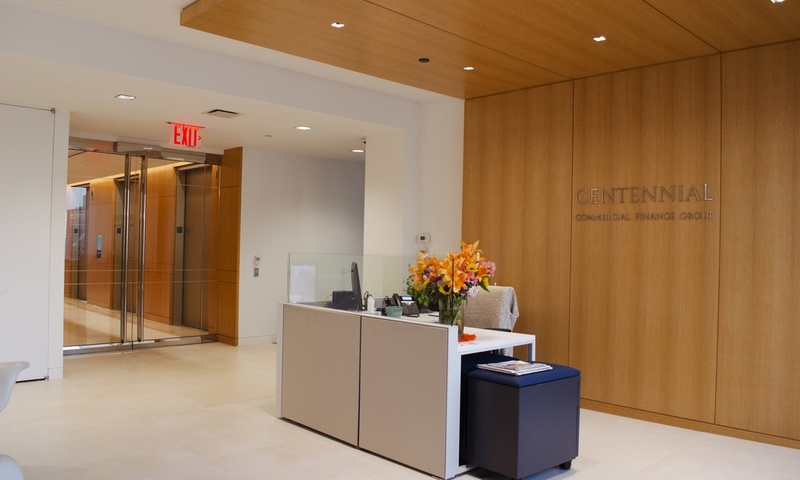 Centennial Bank is a commercial and retail banking institution that hired L&K Partners to renovate their New York City office space. Thespace consists of conference rooms, private offices, open work spaces, an employee pantry and a reception area to greet clients. The end result is a mixture of dark espresso wood finishes, modern furniture pieces with light fabrics and carpets that enhance the natural light that floods the space. Citigroup, one of the world’s largest financial institutions, engaged L&K Partners to assist them with upgrading their space at the historical Brooklyn Army Terminal. L&K Partners was hired to work with the project team to design and install additional cooling and heating units on the rooftop of the building occupied by Citigroup. This project consisted of the installation of new cooling towers (1,200 tons) on new roof dunnage, as well as adding five (5) new air handler systems (70 tons each) to service the space. The project was completed and commissioned within18 weeks. Row NYC hired L&K Partners to build out a food court in their hotel situated in the heart of the Theater District. Thefood hall’s finishes and design captured the unique brand of its residents; Luke’s Lobster, Sigmund’s Pretzels and doughnuts from Brooklyn-born Dough. The scope included kiosks/kitchens, dish cleaning areas and storage rooms for all seven vendors. Multiple exhaust hoods, a mechanical room and a 3-floor hydraulic elevator also completed the space. Dow Jones & Company is an American publishing and financial information firm. L&K was hired to complete the build out of Dow Jones' expansion at their present location. The project involved build out of a new floor and an upgrade to existing spaces. The project was phased to allow for work in place and for budget control. With careful planning and coordination by L&K's project team, the result was a successful project in which all work was completed during regular working hours and the existing tenants were not interrupted. Empire State Realty Trust (ESRT) is an office and retail properties management firm who hired L&K Partners to fit-out their new office space. The new space features custom wood and glass paneling that resembles the art deco style of the Empire State Building. The Essex House, an iconic Central Park luxury hotel, hired L&K Partners to assist them with the conversion of 90 hotel rooms into 30 condominiums. The challenge of this project was to perform the work with minimal disruption to the daily operations of the hotel staff or the hotel guests, while meeting the completion deadline and managing costs. L&K worked with the project team to build out each condominium, paying very close attention to the fit and finish of every detail. The end result is a mix of natural finishes and clean lines, that create a space filled with natural light overlooking Central Park. L&K Partners was hired as the general contractor for the fit-out of EXL’s audiovisual facilities in Jersey City, NJ. The space incorporates state-of-the-art audiovisual features, including a 190” 36-panel touchscreen, lighting control, and interactive information screens for clients. Other features include graphic wallpaper, wood door finishes, conference room and pantry. The space was completed ahead of an aggressive 6-week schedule and turned over to the client for grand opening day. Gagosian Gallery is a contemporary art gallery owned and directed by Larry Gagosian. Opening a storefront gallery and store in an art deco landmarked property, that was previously an old bank, required careful planning and coordination. Working closely in the pre-construction phase with the architect, expediter and landlord, L&K coordinated all aspects of the project from budget control, construction and public assembly sign off with the department of buildings. The project was delivered on time to accommodate a prestigious art show opening. The greater the distance between budget and concept, the more challenging and exciting the project is for us. For Fallon’s new headquarters office, we made the whole many times the sum of its parts, by working closely with the client and the architect as part of the creative effort. Understanding what the architect wanted to accomplish and what the client needed, we were able to help both realize their vision. Our skilled tradespeople created new ways to build what had never been built – or imagined – before. 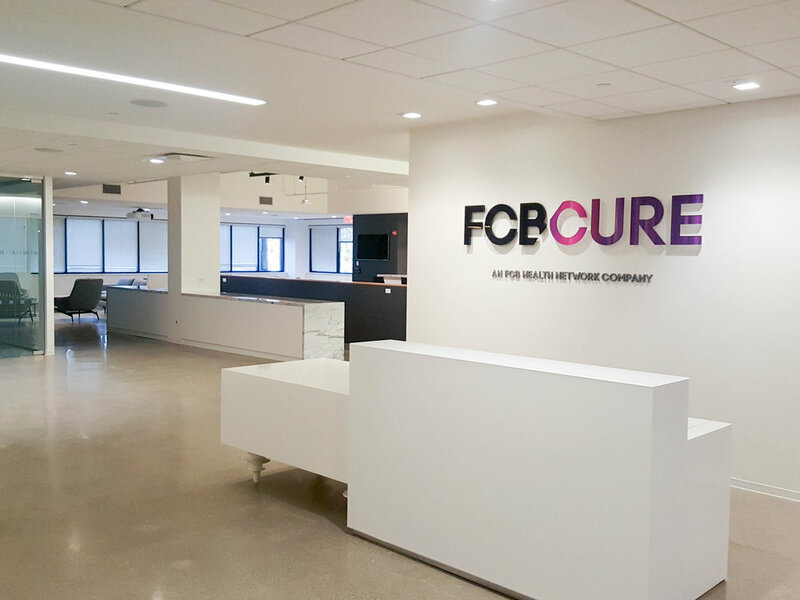 FCBCURE, an advertising and marketing agency that specializes in healthcare communications, hired L&K Partners as the general contractor for the renovation of their office in Parsippany, New Jersey. The project spanned two floors and was handled in two phases. Scope included new interconnecting stairs, open plan workstations, team rooms, and a cafeteria. Grohe is the leading provider of premium kitchen and bath faucets, showers and shower systems. In anticipation of a new branding program, Grohe hired L&K to complete the construction management and build-out of their new NYC Showroom. L&K provided a full cost management and construction build-out under a very aggressive schedule. An intensive pre-construction phase allowed for the space to be realized in the time frame put forth. Gucci, a luxury retail fashion designer, hired L&K Partners to build-out their new space and showroom in the Financial District. The new office space spans between two floors with open workstations, private offices and conference rooms with floor-to-ceiling glass walls, and a graffiti wall designed to represent the Gucci Ghost line. The space features a high-end blackened steel interconnecting stairs, genuine Irish goat hair rugs, and original terracotta ceilings and white marble from 1923. Located just blocks from the Empire State Building and Bryant Park, Hotel Lola boasts some of the best people watching in Manhattan. L&K was retained to upgrade the lobby and public amenity spaces for this high-traffic hotel. We partnered with the design team to create a lavish cocktail lounge and a chic lobby. The outcome is beautifully appointed public spaces withrich, luxurious leather seating, chrome embellishments and a warm color pallet that invites you to linger while enjoying one of the signature cocktails. Interpublic Group (IPG), is a global provider of marketing solutions specializing in consumer advertising, digital marketing, communications, public relations and specialty marketing. L&K Partners was hired to build out a new office space for them in Jersey City, NJ. Vibrant colors are used throughout the space, which consists of interior conference rooms, open plan workstations, private offices, collaboration booths and a combined reception/pantry area. L&K Partners was hired by Intersection, a technology and media company that focuses on design and improvements of urban spaces. Their newly built-out headquarters spans between two floors with an interconnecting stair between lower and upper level pantries. The space is composed of open workspaces, pantries, conferences rooms, large lounge areas, elevator lobby, and telephone rooms. Noteworthy features include an elevator lobby with motion-sensing, LED dotted walls, multi-screen wall LCD screens, and concrete sliding room dividers. Kaplan is a for-profit corporation specializing in higher education programs, professional training courses, test preparation materials and other services for various levels of education. Constrained by a very tight building envelope, L&K worked with the design team to build out their executive conferencing center which consisted of meeting rooms, a café-style pantry and an auditorium. Through careful coordination of infrastructure and finishes, Kaplan’s Executive Training Center was completed within schedule and budget. Khronos is a privately held hedge fund. L&K Partners was engaged to relocate their NYC operations. 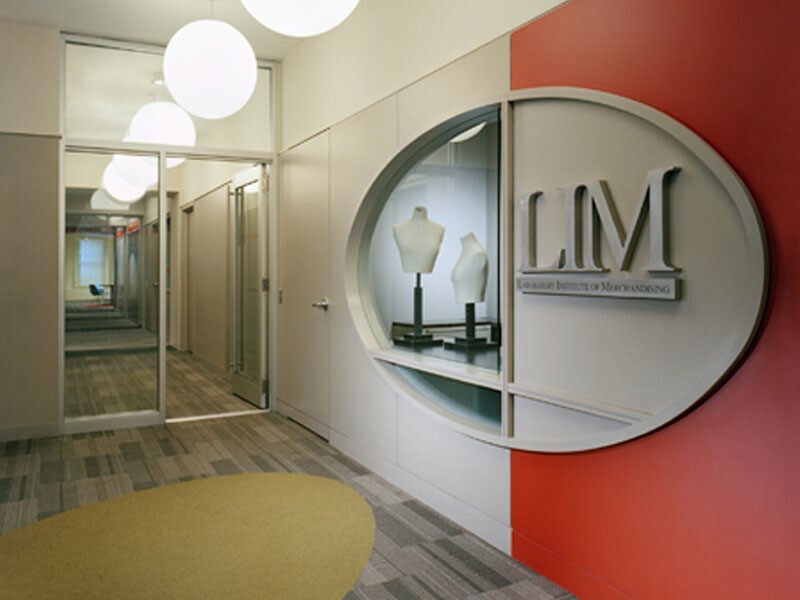 L&K worked with the design team to consolidate all the elements the firm operated with, into one location. Through careful planning, the cutting edge visual design was integrated around the technical infrastructure. The result is a beautiful blend of natural materials and the latest technology. Light Reading, one of the leading global media and research companies, engaged L&K Partners to build out their New York headquarters space. Working in conjunction with the project architect and MEP engineers, L&K Partners was able to build out a space that reflected the company’s dynamic culture and brand image. The new space offered the staff members open plan work areas that encouraged collaboration, as well as enclosed spaces that allowed for “heads-down” work and private conversations. L&K was hired as the construction manager and general contractor to build out LIM’s new classroom campus and student centers across four separate buildings. The project involved detailed planning to budget and establish constructability studies for each building. Once the program was finalized, an aggressive construction schedule was established to allow the project to be completed during the summer months. The project was completed on time and within budget, and the new facilities opened concurrently at the start of the new school year. Marshall Wace is a global asset manager and one of Europe’s leading hedge fund institutions . L&K provided pre-construction services and worked with the architect and engineer to bring the client’s vision into reality, while monitoring the budget and project schedule. The end result is a space filled with custom furniture and herring-bone hardwood floors made of reclaimed wood. Custom glass partitions separate the work space from the pantry and banquet seating, the board room and the lobby areas. M Booth and Next 15 are global communications agencies which utilize science and statistics to creatively shape consumer opinions for some of the world’s most influential brands. L&K Partners was hired as the construction manager for the build-out of their new office space in the heart of New York City. The project consisted of collaborative office spaces, private offices, conference spaces, coffee bar and lounge, and elevator lobby. Coordination of the exposed ceiling with the HVAC details while ensuring clean ceiling details was instrumental to the success of this project. MetLife is among the largest global providers of insurance, annuities and employee benefit programs. The project debuted the new workplace standards for a company-wide roll out. The preconstruction phase called for extensive research on materials, constructability and costing. After the program was defined, L&K built out the project in sixteen weeks, in time for the launch of the ‘workspace of tomorrow’. The Metropolitan Museum of Art is the largest museum in the United States and retained L&K Partners to renovate their European Art Gallery. The assignment consisted of a full cosmetic overhaul including new floors, fresh paint, knocking down existing walls and rebuilding new ones elsewhere. The renovated space created more display walls, allowing the gallery to showcase more masterpieces. The finished project is available for all to experience and enjoy. Moody’s is an international firm that provides financial bond research and credit rating analysis. They hired L&K Partners to build out their headquarters in One World Trade Center, spanning between two consecutive floors. The space comprises open workstations, conference rooms, pantries, elevator lobbies, and floor-to-ceiling wrap-around windows which boasts spectacular views of New York and New Jersey. Net-A-Porter is an online fashion retailer for luxury fashion brands. L&K Partners was hired to build out their first flagship in the US. We collaborated with their UK based team to replicate the design of their London headquarters in NYC. Constrained by a very tight building envelope and old terracotta structure, L&K worked with the design team and trades to ensure these constraints did not affect the overall look of the space or environment. The result is a beautiful flowing work space, mixing old world architecture with the latest technology and infrastructure. L&K Partners was hired to renovate student resident rooms and to upgrade the HVAC and plumbing systems to NYU’s Weinstein Residence Hall. The project required detailed planning as renovations at the residence occur only every 15 years. The construction window was 12 weeks between semesters. With concise planning and implementation, L&K Partners procured all materials in advanced and renovated the entire building in time for the fall enrollment. L&K Partners was hired to work with the Paramount’s owner and the design team to renovate the hotel’s legendary Diamond Horseshoe nightclub. The nightclub is housed in the basement of this historical landmarked building and includes a fully operational kitchen, multiple bars, banquet seating and a stage for performers. Ospraie Management is an asset management firm focused on commodities and basic industries from a fundamental investment perspective. For their office relocation project, they hired L&K Partners to build out their new office space. We collaborated with the architect to design and build a customized sliding partition behind the reception desk, to mask a door to the mechanical equipment room using onyx partitions. The end result is a space that reflects the brand image of the client with clean lines, warm earth-tone hues and a sophisticated attention to detail. L&K was hired as the general contractor for the renovation of Penguin Group’s 345 Hudson Street facility. Working very closely with the design team and the client, we built out the new facility within a very aggressive time-table. Expedited approvals and construction methods were implemented to ensure that the schedule was met and the budget controlled. The result is the new “work place of tomorrow” for Penguin Group. Popular Community Bank is a multi-service bank that hired L&K Partners to construct its NYC flagship retail store. The final design features a double height customer area, hanging glass sculptures, back lite column enclosures, 2 multi-media walls, a curved glass handrail, marble spiral stair with integrated handrail and several interactive banking stations. Royalty Pharma, a global leader in the acquisition of royalty interests, hired L&K Partners to provide construction management and general contracting services for a full floor fit-out of their New York City office. Working in tandem with the architect and engineer to manage the budget and schedule, the space features floor-to-ceiling glass walls, a knife edge cove-light system, stainless steel trimmings and Sahara-colored ESD floor tiles. The end result is an elegant space that reflects the culture and brand image of the firm. L&K was hired by ShoreTel to build out their new headquarters in NYC. L&K worked with the project team on multiple site evaluations and cost benefit analysis’ to help find the best location with the best value for ShoreTel’s new office. L&K completed a detailed pre-construction program and built out the space within budget and schedule. Despite a massive storm in NYC, L&K worked out of sequence to ensure that the original target move-in dates were met and ShoreTel occupied their new home on time. L&K Partners was hired by ShutterStock, a stock photography and stock music provider company, to fit out their new office space. Their new space consists of open office space, conference rooms, cafeteria and dining area, and a new elevator lobby. Slate, the online politics and culture magazine, hired L&K Partners as the construction manager for the renovation of their new office space in Downtown Brooklyn. The final result features an open office area with benching stations, conference rooms, telephone rooms, and a reception area. Construction also resulted in eight sound studios featuring two layer studs and sound proof doors. The sound studios exceed sound transmission classlevel requirements while being built to specifications, resulting in superior sound damping within budget and ahead of schedule. L&K Partners was hired as the construction manager and general contractor for the renovation of 300 guest rooms and guest corridors of the Carlton Hotel in NYC. L&K established a detailed schedule and program that allowed the hotel to maintain maximum occupancy and avoid any guest or operations interruption during renovations. L&K Partners, in partnership with the architect and engineer were able to deliver fully upgraded and finely appointed guest rooms within a 20 week construction schedule. Starwood Hotels & Resorts Worldwide, Inc. is one of the most global high-end hotel companies in the world. 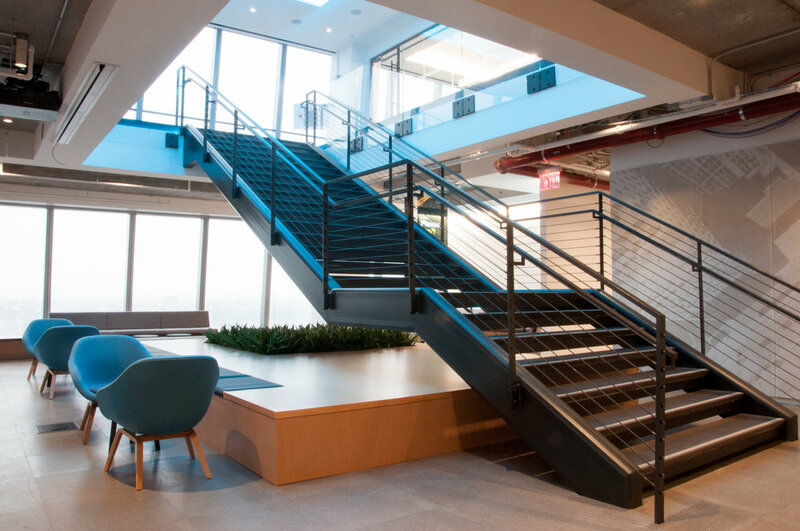 L&K Partners was retained to build out their New York office space which boasts an interconnecting staircase, open plan offices, branded conference rooms and multiple employee pantries. The end result of the renovation offers an open plan environment with multiple “head’s down” meeting areas while reflecting Starwood’s multiple brands and company culture of client centric innovations. L&K Partners was hired as the construction manager for the build-out of Tokio Marine’s office space in Jersey City, NJ. The space was located on the top floor of the building with several supplemental AC units installed. The space is composed of a reception area, conference rooms, pantry, and workstations. Topshop is a British multinational retailer that specializes in fashion clothing, shoes, make-up and accessories. They engaged L&K Partners to build out an expansion space for their retail store within a very aggressive schedule. The renovation included additional retail space, back office space and a personnel shopper area with fitting rooms. The final space was delivered within the eight week schedule and reflected the brand image of Topshop, while delivering a high-end retail experience to their customers. 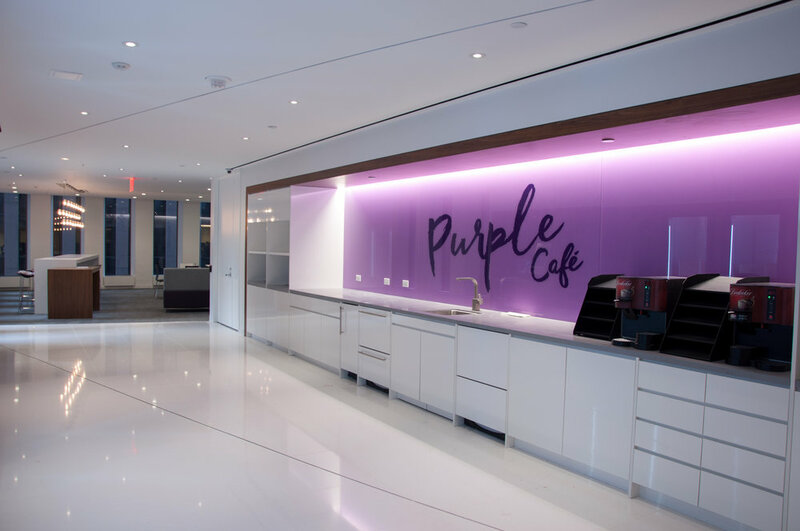 Willis Towers Watson, a global advisory, broking and solutions company, hired L&K Partners as their construction manager for the renovation of their existing office space and construction of a new grab-and-go. The completed renovations include a free-address open plan office with conference rooms, telephone booths and a café area. Special installments include demountable office fronts, writeable surface painted walls and acoustic wall coverings. Through careful planning and efficient management, L&K was able to finish the renovations four weeks ahead of schedule. Y&R and Wunderman, both members of the WPP Group, are advertising, marketing and consulting companies. The new headquarters office consisted of ten floors with open plan work areas, collaboration spaces, a cafeteria, outdoor terrace space and multiple inter-connecting staircases. We worked in partnership with the client, owner’s representative, architect, and engineer to find creative solutions for meeting the aggressive schedule and achieving cost savings throughout all phases of the project. L&K Partners is a full-service, mid-size construction management and general contracting firm located at Park Avenue South and 25th Street. We pride ourselves on being a relationship-driven firm that works with some of the most successful companies in the world. Ours is a small industry, so our reputation is everything. Every person we hire is considered an ambassador of our firm. Someone with a strong interior construction background that is as comfortable speaking to a client as they are a subcontractor. The ideal candidate should have 10 years experience. A detail oriented person with a proven track-record of estimating interior projects and managing multiple projects simultaneously. The ideal candidate should have 7 years experience. A QS background is a plus. Someone with strong attention to detail to manage the paperwork process of an interior construction project. The ideal candidate should have 3 years experience. Interior construction or architectural background is a plus.